This entry was posted on Tuesday, February 3rd, 2009 at 12:02 am	and is filed under Uncategorized. You can follow any responses to this entry through the RSS 2.0 feed. Both comments and pings are currently closed. Took me a while, but I got it. Hilarious! I didn’t get it when I was only looking at the picture, but when I read the caption it made me crack up. Keep up the good work, and I hope you don’t run out of ideas. Thank you for the gracious comments. I read each one, and they really help motivate me to keep the Courtoons coming–even the one the first week that said “keep your day job.” (Wait until Supremacy Claus finds that person.) Anyway, thanks again. See supra. Back to my day job…. These are awesome! I enjoy the intellectual humor, without having to reach for a dictionary or Wiki something, like I do with some of Dennis Miller’s rants! Great job and please keep them up! Those who can’t – teach. Those who can’t teach – troll. Day-job guy here. I laughed at this one. Some of these are pretty clever. That said, I’m pretty sure you still need that day job. @WTF (aka Day-Job): Welcome back. I’ll tell Supremacy Claus to hold off on you. I’m also pretty sure I still need that day job. Dave, is there a way to see all the older cartoons? Yes–just click anywhere on the red header of the page to go to the main site, which shows all of them. You can also Google “Courtoons” and it will get you there. Yes, definitely keep the courtoons coming! I know I, and my law school cohorts, check the site everyday! Make this one more thanks for keeping these up; this one and Supremacy Claus were epic. I’m such a sucker for bad puns. :-) They’re also a good way to slowly learn legal terminology if you’re not doing more than dabbling. Great stuff! 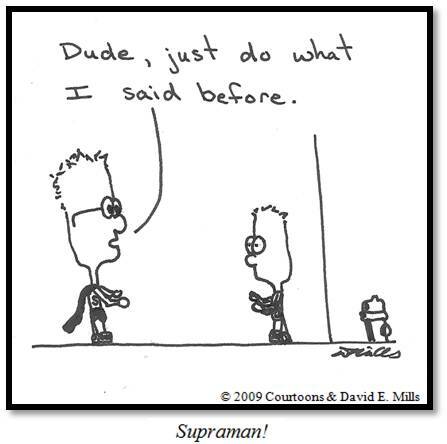 A Supraman T-shirt would be perfect for casual Friday! As a former journal editor — Hilarious!! I love nerdy-law humor.